The Voodoo Experience, a New Orleans music and art festival typically held on Halloween weekend and known for having many famous alternative acts, will return to City Park on Nov. 1-3, and tickets are selling rapidly. 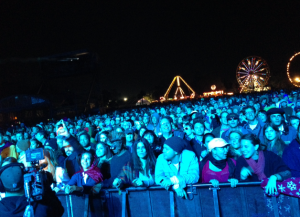 Jack White’s performance wraps up the 2012 Voodoo Experience. This year’s event will be the 15th anniversary of The Voodoo Experience. The festival grounds in City Park will hold the event as always, spanning a large area of the park with four different stages, as well as many food vendors, art exhibits, and merchandise tables. Headliners for the 2013 Voodoo Experience include Pearl Jam, Nine Inch Nails, The Cure, Kid Rock, Calvin Harris, Bassnectar, Paramore, Macklemore & Ryan Lewis, Afrojack, Matt & Kim, Big Gigantic, and the Preservation Hall Jazz Band. 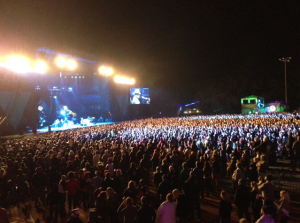 The 2012 Voodoo Experience had a great turnout with headliners including Metallica, The Avett Brothers, Die Antwoord, Awolnation, Jack White, and Skrillex. Fans crowd around the stage to watch their favorite acts. Passes for the event have been on sale since December 2012. Ticket prices for the event began at a rather low rate of $99 for a three-day pass and increase up until the date of the event. Currently, a three-day pass for The Voodoo Experience is $200. A VIP three-day pass costs $550, and single-day passes cost $87 each. A three-day pass at the gate will be $250, if available. New to 2013 Voodoo is The Artist credential that costs a steep price of $2,500 for two individuals. This pass offers all of the amenities of VIP along with exclusive backstage and stage access. A very limited amount of these credentials are on sale. Also new to Voodoo this year is non-VIP camping. Last year, VIP camping credentials were offered, as they are offered this year, as well. VIP camping passes allow two people access to the festival along with a designer tent with many amenities including air-conditioning, electricity, and 24/7 security. Non-VIP camping allows Voodoo-goers to bring their own tent and pitch it in a designated camping area. Around the clock security is also part of the non-VIP camping credentials. Individuals wishing to attend the 2013 Voodoo Experience should purchase tickets as soon as possible because they could possibly sell out.